This is another one of those ridiculously delectable smoothies that I must remind myself is as healthy as it tastes good. If you occasionally have sugar and/or chocolate cravings like I do, treat your sweet tooth with this delicious and satisfying smoothie without feeling an ounce of guilt. 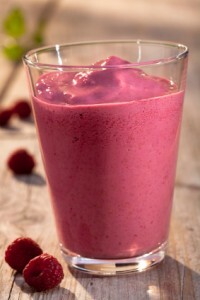 This chocolate raspberry smoothie also makes for a healthy dessert and is sure to be a hit! It’s hard to top the chocolate-raspberry combination. Add a little banana and coconut oil into the mix and you’ve got all of your nutritional bases covered. The fruit and cacao provide plenty of antioxidant power along with vitamins and minerals such as potassium, magnesium, vitamin C, manganese, and fiber. A good healthy fat like coconut oil is vital to great health. Think healthy skin, hair, heart, and immune system, weight loss and good digestion. If you supply your body with ample amounts of good fats, it has no need to store excess fat because you’re sending the signal that hunting season is good. If you don’t have cacao powder or nibs, you could use a chocolate protein powder to flavor, or make this smoothie minus the chocolate. It will still taste delicious! I ended up using a little Greek yogurt the last time I made this and it turned out extra creamy. Enjoy! Place all of the ingredients into your blender and blend away (usually 30-45 seconds) until the desired consistency is reached. If you try this chocolate raspberry smoothie please leave a comment below and tell me all about it. Happy Blending! Super delicious!!! I added greek yogurt and vanilla extract. I have made this smoothie 4 times now. Make sure to add the coconut oil. I forgot it this last time and it doesnt taste quite the same without it. Made a variation of this recipe today and it hit the spot! I used raw milk, frozen raspberries, raw egg, goji berries, coconut oil, cocao powder, vanilla, gelatin, turmeric, sea salt and a splash of maple syrup. Yum! Thanks for the inspiration! We have our own chickens, cows, orchard and berries so it’s fun to experiment. I love it with vanilla almond milk and a strawberry thrown in to make it more sweet as well as maca or lucuma powder. I have a smoothie/juice shop in Ohio and this is going to be a staple! Nice add-ons, Amy. You’re no smoothie newbie :) Good luck with your smoothie/juice shop! If I’m ever in the area I’ll be sure to stop by. This was absolutely delicious. I just had jaw surgery and have been trying to find tasty ways to get the nutrients I need. This was a real winner. Thank you! What’s a good way to make this a full calorie smoothie? Trying to add a few pounds on. This was deeeeeelicious! I didn’t have a banana so I used a few peach slices to sweeten it. The ratio of cocoa to raspberries is perfect.